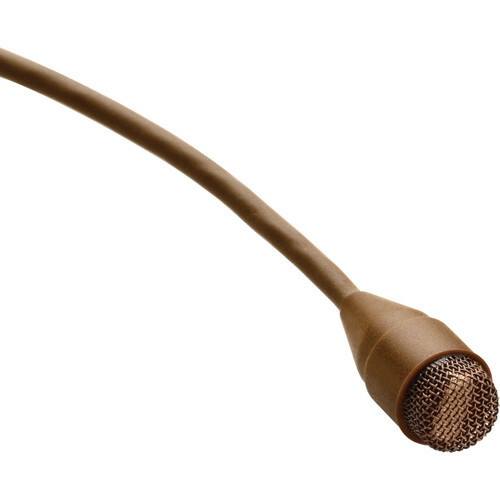 The brown d:screet 4061 Omnidirectional Lo-Sens Microphone Kit with Windscreen, Clip, Concealer and Pigtail Connector from DPA Microphones is a kit designed for use in performance applications to capture audio for broadcasters, TV studios, news anchors, stage plays, and more. It features a 4061 omnidirectional condenser microphone with a frequency range of 20Hz to 20kHz. This kit includes a windscreen, mic clip, and a concealer for hiding the microphone from view. The concealer is a clear disk that can be sewn into clothing. The 4061 mic is powered by 48V phantom power. It is built with a reinforced cable relief to withstand the constant twists, bends, pulls that are part everyday use. The kit includes 2 different protection grids which allow you to acoustically modify the microphones response. The response will vary according to the placement of each grid. The 4061 omnidirectional miniature microphone has a low noise floor and can handle high SPLs. The pigtail connection, miniature mic holder, miniature concealer, 2 protection grids and windscreen are included. The omnidirectional condenser mic does not need to be aimed directly at the sound source when recording. This offers more detail and a natural sounding sonic character when recording in various environments. The d:screet 4061 miniature mic is designed to withstand the toughest of conditions. A double vent protection system provides a greater resistance to humidity and sweat. The microphone features a reinforced cable relief, gold-treated diaphragm and microphone housing, plus a Kevlar-reinforced cable. The kit includes 2 different protection grids. The soft-boost grid introduces a 3 dB soft boost around 8 - 20 kHz for applications where the miniature microphones need to be placed on the head of the performer. The high-boost grid introduces a 10 dB soft boost around 12 kHz for applications where the miniature microphones need to be placed on the chest of the performer. The metal grids are anodized stainless steel. Whenever the 4061 miniature microphone needs to be hidden on a performer, the DMM0012 comes in useful. Simply place the 4061 in the opening on the backside of the holder. The microphone is now secured from friction noise from clothing because the microphone (including the grid) is hidden and the holder itself is smooth.